DD5LP – SOTA EUROPE – April 25th. 2014 – DL/AL-169 Auerberg. As April 25th. was ANZAC day in Australia, it is a public holiday, so there may be some activators out and it is also one of only 3 days in the year when the AX prefix for Australia can be used instead of the usual VK prefix. 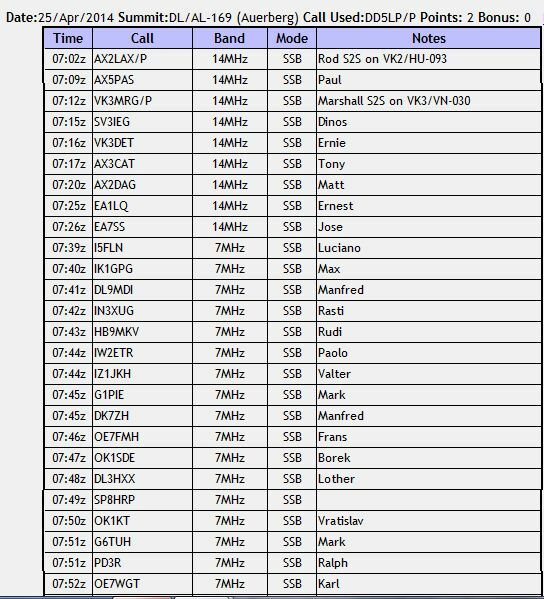 The plan for this activation was again to work chasers from VK and if possible also work Rod VK2LAX/P as a Summit-to-Summit contact. 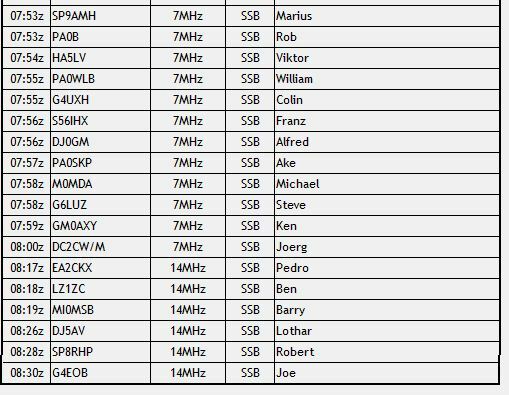 Martin DF3MC unfortunately had to work (as it is not a public holiday in Germany) and so could not make this activation either, maybe the next one. Wx forecast – Sunny and fine. Wx previous day – fine. Wx forecast for following days – rain. Actual Wx -sunshine but cool in the shaded area where I positioned myself. Time on Summit: 1.5 Hrs. 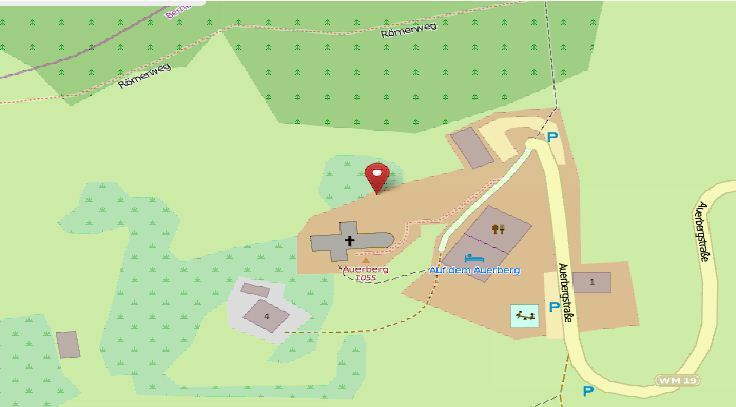 Auerberg has easy road access with very little walking required. This is similar in some ways to Peissenberg with a church located on the absolute summit and a restaurant / cafe located next door. As my wife (who offered to come along) had twisted and badly bruised her ankle a couple of days previously, a summit with a lot of walking was out of the question. Unlike the previous two summits that I activated, this summit has wonderful views for 360 degrees around it. The drive was just over an hour and I was set up and operational by 9am local (0700 UTC). This is a later start than my previous activations as I wanted to see how long the long path window to VK from DL was and indeed after about forty minutes the window closed and no more DX contacts were possible. This beautiful location of course attracts the public, but being a Friday morning, before lunchtime very little was happening. Around 11am a lot of motorcyclists and some more cars arrived, but by this time I was packed up and enjoying a warm drink at the cafe before we left. All in all a successful activation however band conditions on 20m were not nearly as good as the previous Sunday (they were exceptional that day). Once I switched from 20m to 40m, I was flooded with calls – a good pile-up for about 25 minutes. Remembering this was a Friday when many people are at work, I suspect an activation of a summit on a weekend could be quite a thrill. I am also glad to report that my first contact was with Rod – AX2LAX/P a S-2-S contact as Rod had gone out to Mount Elliot (VK2/HU-093) to make some more chaser points. One more s-2-S and chaser contacts were made into VK all with more difficulty than during the activation the previous Sunday. During the activation I was again faced with the situation where a station came up on frequency while I was using it. This time however I did not move frequency but rather kept calling and after two extremely strong Spanish and Italian stations called me for the SOTA contact the Eastern European stations (Rumania?) decided THEY should move. So a win for the little guy with the help of some high power chasers – thanks guys! This entry was posted in SOTA and tagged Auerberg, DD5LP, DL/AL-169, SOTA by VK2JI DD5LP G8GLM. Bookmark the permalink.